The Northern Masked Weaver Ploceus taeniopterus is a typical 'masked weaver'. 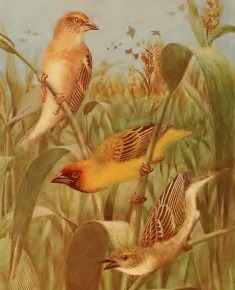 The male in breeding plumage is distinguished from other masked weavers by a combination of the brown eye and the black mask that extends as far as the breast. The female has a dark eye and yellow supercilium - the upperparts are browner and the bill is darker than in the female Vitelline Masked Weaver P. vitellinus. The juvenile is similar to the juvenile Lesser Masked Weaver P. intermedius but the former has a grey eye and slightly thicker bill. The Northern Masked Weaver is abundant in Sudan and South Sudan from Khartoum south along the Rahad River and the White Nile. 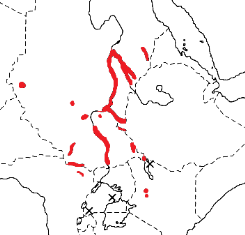 It also occurs in south-west Ethiopia, north-east DRCongo on the Upper Uele River, and western Kenya at Lakes Baringo and Bogoria (see red on map right). The population in Darfur, western Sudan, was separated as a subspecies but specimens fall within the general range of plumage variation of the species, and it is thus treated as monotypic. The Northern Masked Weaver inhabits tall grassland with acacia trees, along larger rivers and swamps. Outside the breeding season it forages in flocks and forms large roosts in marshes, away from its nesting areas. Its diet is mainly seeds, including those of cultivated sorghum and millet. It also feeds on snail shells, and insects including beetles and cockroaches. Nestlings are initially fed with insects. In parts of Sudan, flocks of thousands of Northern Masked Weavers and Ruppell's Weavers P. galbula cause extensive damage to crops. The Northern Masked Weaver is polygynous and colonial. Colonies may be small with less than 10 nests, or large with more than 30 nests. The nest is oval, with the entrance below and no tunnel. The outer shell is woven of strips of grass. A thick inner layer consists of broad grass strips, and a ceiling of grass heads is added. The nest lining, most probably added by the female, is a layer of grass strips with some plant or papyrus down. The nest is supported by vertical stems of reeds, long grass, papyrus stalks, or shrubs. There are 2-3 eggs in a clutch. The eggs are highly variable and may be green or brown, and plain or spotted with brown and red-brown markings. The female incubates the eggs and feeds the chicks. The last-hatched chick in a clutch often dies of starvation. Intraspecific brood parasitism is common in some populations; in addition to laying her own clutch, the female lays some eggs in the nests of other females. The Northern Masked Weaver has no PHOWN records (see PHOWN summary) and many are needed to study the variation in colony size in this species. 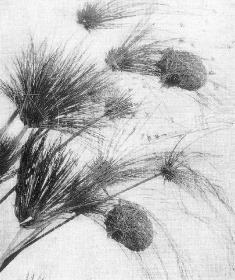 Submit any weaver nest records to PHOWN (PHOtos of Weaver Nests) via the Virtual Museum upload site.